Urška is the head of our office and makes sure that everything runs smoothly, especially when it comes to all the paperwork necessary for your trip. As the organizational mastermind in residence, she makes sure that you have all the information you need before, during and after your trip as well as ensuring that our guides, scattered around Slovenia, Croatia and the rest of the world, have all the information necessary to guide their tours without any glitches. Although she now only works in the office, she has always been an outdoor person. Joining the Scouts at the young age of 10, she discovered a passion for organizing hikes and camping trips, which she still loves to do in her free time. Urška is a married mother of two playful young boys. Rudi, their golden retriever, rescue dog, keeps them company. 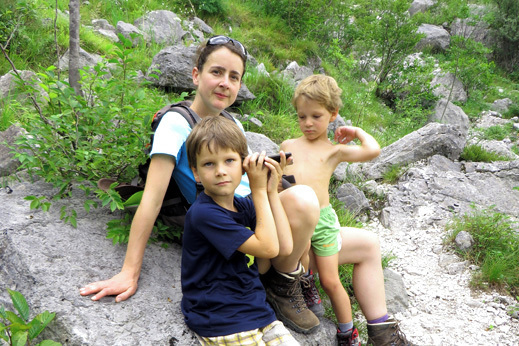 Whenever she needs to “unplug” from the office she loves to hike in the Slovenian mountains, go on a road trip through the Balkans with her family or relax on the warm tropical beaches of Southeast Asia. Everyone at TrekTrek is in awe of her baking skills and can’t wait for the next time she brings a batch of homemade brownies, tiramisu, freshly baked bread or dark chocolate with hazelnuts to the office.